Our giveaway ended on June 8th. Angela Lent was our lucky winner! 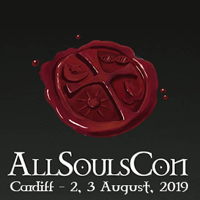 She will receive an All Souls Trilogy themed prize pack that includes the paperback edition of The Book of Life, a signed copy of Diana’s commonplace book, an ouroboros mirror and six alchemical buttons. Congratulations, Angela, and thank you for your long-time support! 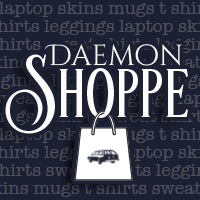 AllSoulsCon is currently hosting 'The Book of Life Theories' Giveaway! Enter their contest by sharing your 'Ashmole 782 creation theory' for a chance to win one of three prize packages (see above)! The contest starts June 8 and ends at midnight on June 20, 2015 PDT. Open to everyone worldwide. For more information and to enter, visit www.allsoulscon.org/giveaways/. This article includes an excerpt from The Book of Life, Q&A, Author Essay and more. 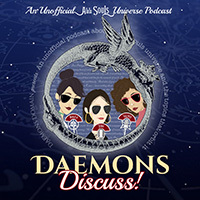 Just like the All Souls Trilogy, whether you read this Q&A for the first time or as a re-read, there is plenty of intriguing and valuable information to comb through. As always, you can find some of these articles archived in our downloads library in .PDF format. Once again, we are picking up where we left off on Deb's book tour. 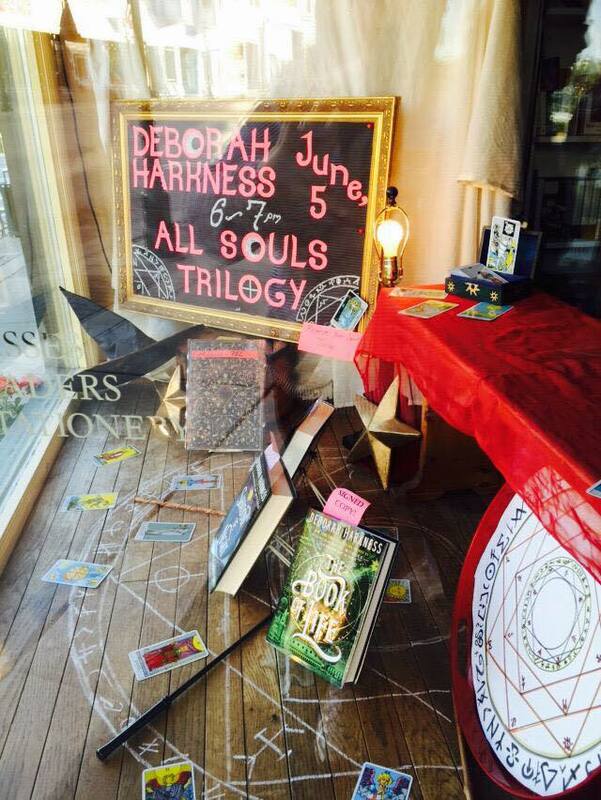 We were fortunate enough to have more eyes and ears at some of Deb’s 'The Book of Life' events. Those contributions have made these reports that much more fun to do. Thanks go out to our own, Angela Hutter and long-time supporter and friend, Lisa Stafko! Deb visited Crooked Tree Arts Center in Petoskey, Michigan. 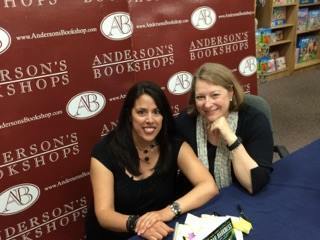 On to Anderson's book shop in Naperville, Illinois. Thanks again to Lisa and Angela for their reports on the event experience! 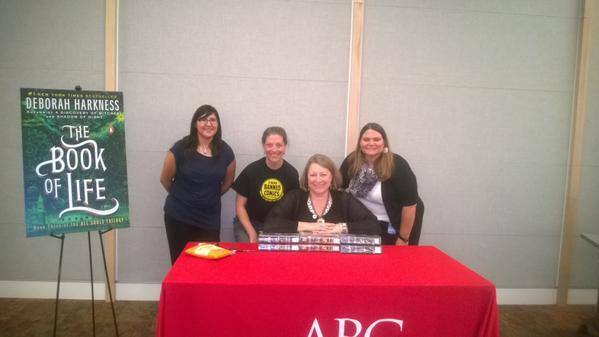 Deborah Harkness is the best! If you get the chance to attend an event, you have to be there. She talks about the story, the process, shares her ideas and answers questions. She reads a passage to you from the book. When it comes time to sign books, she talks with each person and poses for pictures. She is very generous with her time, and you never feel rushed. Very enjoyable event and worth every moment spent. Deb, Lisa, and Lisa's daughter! Anderson, LOVED ADOW so much that she helped start the buzz about the All Souls Trilogy. 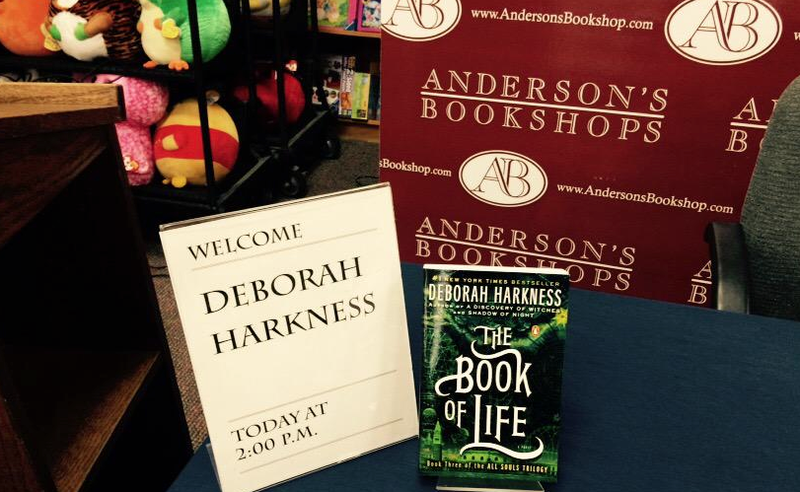 Deb said that the stop was special as it brought her full circle with the conclusion of the trilogy and The Book of Life paperback returning to Anderson’s. 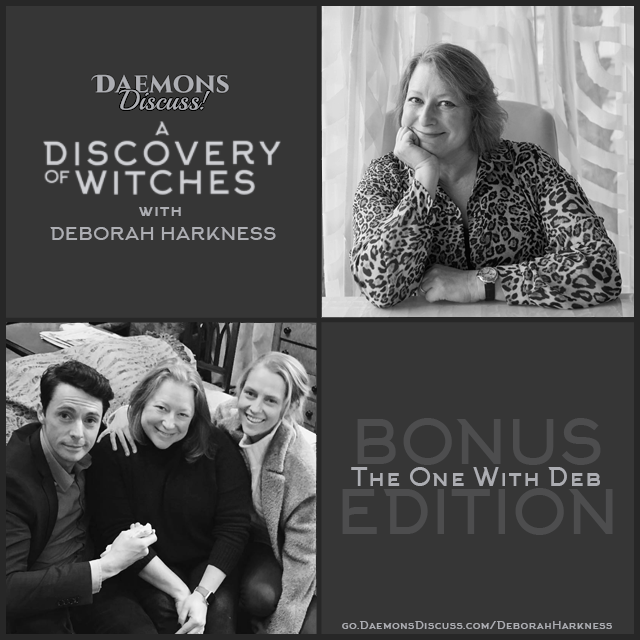 Deb greeted the standing room only crowd, thanked Anderson’s Bookshop and dove right into recapping the three main characters of the All Souls Trilogy: Diana Bishop, Matthew Clairmont and Ashmole 782 (no, not Gallowglass and not even Philippe). She described them as an nontraditional love triangle – definitely a three-way relationship among them. She highlighted a fact about historians and characters that transcend time periods: "You never want to let a historian at something or someone who could have memory that extends beyond 1500 years." With all of the time with which Deb had to play, we were never going to see a 70 year-old vampire from her. She enjoyed writing Matthew, a main character, who experienced long swaths of history, extending far back in time. She said that we may have fallen in love with Matthew Clairmont because he’s dashing, handsome and charming (yes, yes, and yes! ), but she fell in love with Matthew because he was an eyewitness to so much history that she finds fascinating (also yes!). The scope of the each book was examined so that we could see the progression of Matthew and Diana’s relationship. 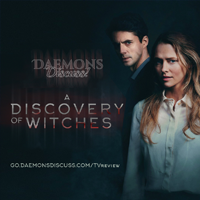 In A Discovery of Witches, the scope is very limited. Except for an unfortunate visit to the garden and a walk through the forest, Diana and Matthew spend most of their time together indoors. In Shadow of Night, Diana and Matthew begin to go beyond themselves, meeting friends and family. In The Book of Life, Diana and Matthew become the focal point or center of a family unit. 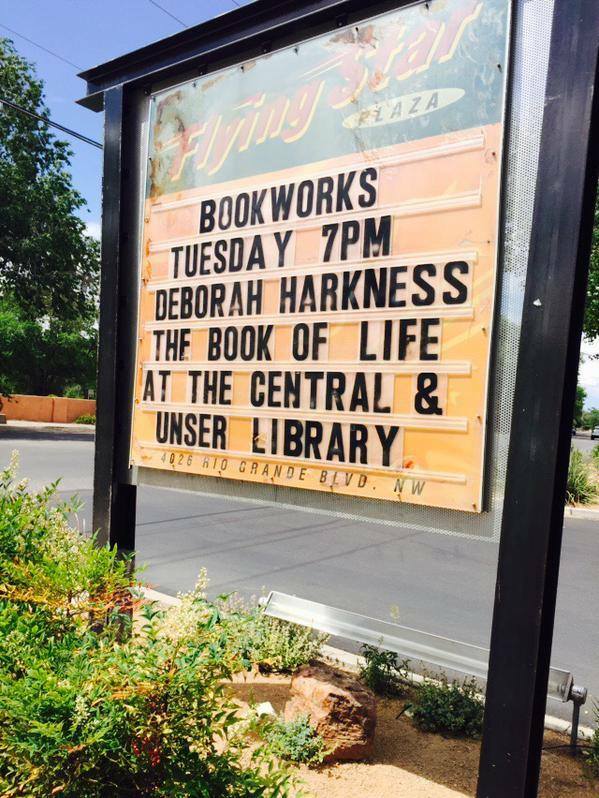 Deb read the first chapter of The Book of Life but brought us back to the point of “Endings. Beginnings. Change.” She emphasized that we have been going through that cycle with the characters since 2011. And in reality, Deb’s life is all about endings, beginnings and change – constantly. To illustrate her point, she noted that she turned in grades on May 19 and hit the road on May 24 to start the US book tour. Like a mind reader, she answered the unspoken question: How does she juggle being a historian, professor, author, etc.? She said that she’s not superman where she goes into a phone box and puts on a cape and comes out an author. Nor does she go back in and put on a tweed jacket to become Professor Harkness. Those roles in her life are completely interconnected and inextricably linked and woven together parts of who she is. I guess you can call her a weaver in her own right! Deb describes herself as a being in the business of professional storytelling - whether she is a historian or novelist. As a historian she believes the past is meaningful and relevant to the future. As a teacher she stands at the podium, wags her teacher finger at you and tells you just that. As a novelist, she says it’s her job to show you instead. Thus, in part, the All Souls Trilogy is an attempt to show how important the past is to the decisions we make today. In the case of Diana and Matthew, it was crucial that they go back to the past to learn about themselves. There were things they had to learn about themselves that could only be learned in the past. Therefore, time walking is not a gimmick plot twist. It was necessary and important to Deb the novelist and historian. Among the many hats that Deb wears are teacher, historian and researcher. Because of that, the trilogy that is written also demonstrates her love of all of those things, as well as her love for libraries and the preserving and archiving of books. She says a book can change the world. After reading the All Souls Trilogy, I would have to agree. Q: When does Gallowglass know what his feelings are for Diana? A: Gallowglass has a lot of self-knowledge. There is not a moment when Gallowglass does not know what’s going on in his world. That’s what makes him so appealing. He has an incredible ability to face truths. Q: Can we assume that Deb will write in the same genre? Q: On Facebook, are the Diana and Matthew profiles run by Deb and her group? A: First, Deb said she doesn’t really have a group other than her assistant, Jill, but the answer is YES. She created the profiles because she didn’t want anyone else to be those people. 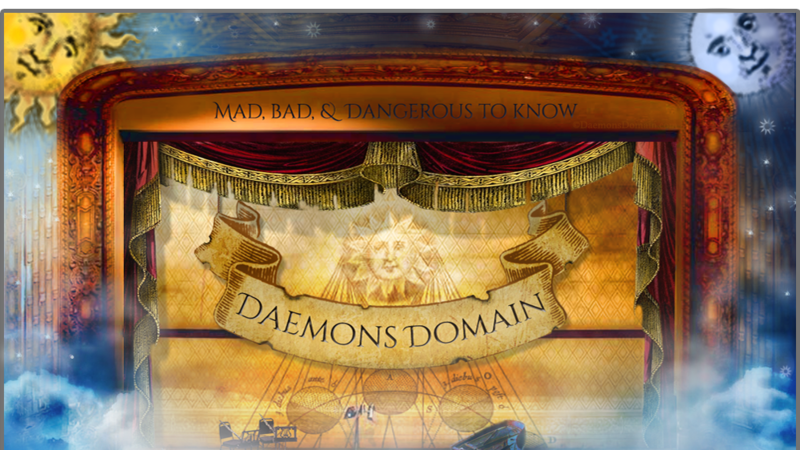 She started them and bought related domains two years before A Discovery of Witches even came out. She not is comfortable with anyone pretending to be her, Diana, Matthew, etc. Q: As far as editing, was there anything that was cut that Deb didn’t want to be cut? A: A few extra words were edited, but nothing to the story structurally was cut. On a side note, she did say that it was difficult to start The Book of Life. She said that after Shadow of Night, it was like trying to launch a 747 with a rubber band. Deb’s first instinct would have been to start right off with Diana, but it would not have been satisfying to have Diana return to Sept-Tours on the first pages and immediately be confronted with bad news. Q: So many love her Spotify lists. How does she utilize them? A: Deb writes to music and when each paperback is published, she releases her lists. When she’s brainstorming the details of the plot, she may take inspiration from a song or alternatively, if she is writing, she may think of a song and put it in the playlist. She stressed that she listens to music all of the time. She doesn’t outline. Instead, she arranges the playlists before she even starts to write. Music also helps her reconnect with her writing when she’s taken a break from it for long or short periods of time. If she knows what music she has playing for that chapter, she will put it on a loop. It will take her right back to the emotions that she’s trying to tap into. It’s also helpful to have the other character playlists to know what they like, dislike and feel since she writes from Diana’s POV so frequently. Q: Does she have conversations with her secondary characters – dead or alive. A: Yes! She says she does have conversations with them. The characters are so integrated into her life that for example, she can walk around Anderson’s Bookshop and know exactly what Baldwin would be reading. Another example is of Deb hearing Godfrey calling out to his mate. Because of that, she now knows his mate’s name when she didn’t before. 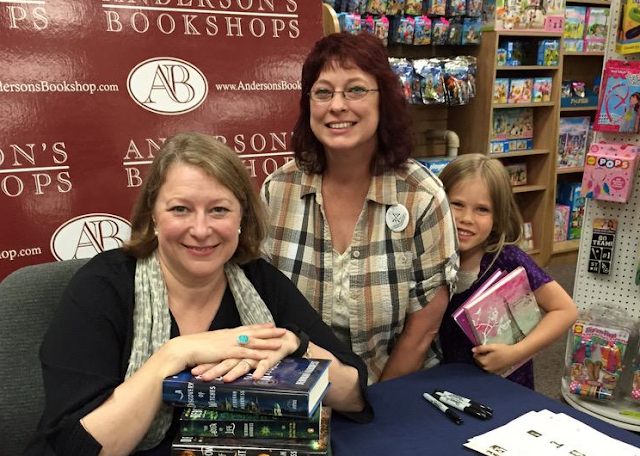 As with other signings Deb greeted and took pictures with readers, signed books, met family members who tagged along to the event and of course, answered more individual questions. She spent plenty of time with each person and puts all of her attention on you in your moment. She is a woman of grace and humor - not too mention a lot of information! And now, I have an Easter Egg to crack. Earlier this week in the Reddit Q&A, I asked for a wee bit more information on particular passage. She replied that she has given us all the hints she’s going to give us (which is just the text in the book). Ahhh, Deb, you are ever the perpetual teacher -- letting us make our own discoveries. I appreciate and adore you for that. Safe travels always in all of your literal and figurative journeys. • Please check her EVENTS feed on Facebook for complete event information, including signing line policies and ticket buy links (if they have them). • She recommends always checking back with the venue to make sure your pre-orders are set (if you made them). This is especially vital if you want to order the new paperback boxed set of the trilogy (on sale now), the hardback boxed set of the trilogy (with commonplace book included), or hardbacks of ADOW or SON. They will have these items on hand in limited supply. Keep an eye on Deb's event calendar for detail updates on this rescheduled event. As always, to see any additional details Deb has added to any of the events we posted, please visit her Event page on Facebook.